You may recall that around this time last year, I requested you to complement or divert your qurbani (sacrifice) budget for donation of animals to those poor rural women who had lost their animals in the floods of 2010. I am making the same appeal this year as unfortunately, the situation is not any better. 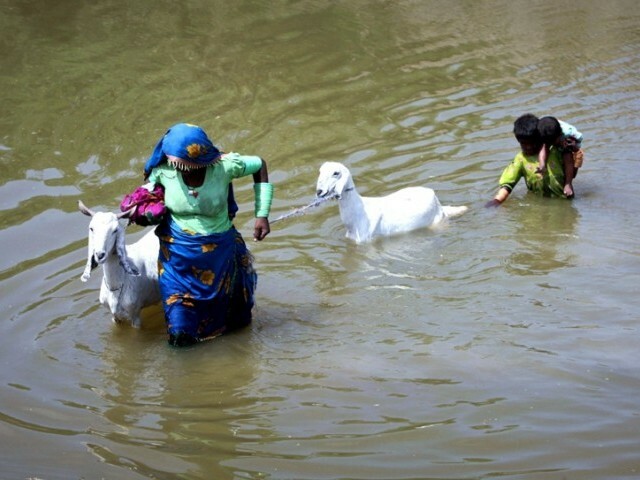 According to Provincial Disaster Management Authority Sindh, 115,586 animals have perished during this monsoon. Besides, thousands of villagers from the rain affected districts sold their animals at throwaway prices as they had no money to feed themselves or animals. Before making a fresh request, it is my pleasure to report that in response to the appeal launched last year, a total of Rs 2.9 million were collected and the donations continued throughout the year. We spent Rs 2.4 on the purchase and distribution of 202 female goats (details the of beneficiaries here: Jamshoro Sehwan goats distribution) in several villages of Districts Khairpur Mirs, Dadu, Jamshoro, Shikarpur and Shahdadkot. Rs 500,000 are still lying with us as we got this donation quite late. Last week, I asked my colleagues to go to these villages and find out the status of the distributed goats. Briefly speaking, 18 out of 202 goats died, 40 were sold, and 91 baby goats were born. Main cause of death was reported as viral disease as villagers do not have enough awareness and vaccination centres are usually non-functional. From the earnings of 40 sold goats, 7 women purchased calves, two women together bought a scooter and now renting its services, one woman bought the donkey cart, one got her eye operation done, 8 women got their shelters repaired, and the rest used the money to meet severe illness expenses of family members.